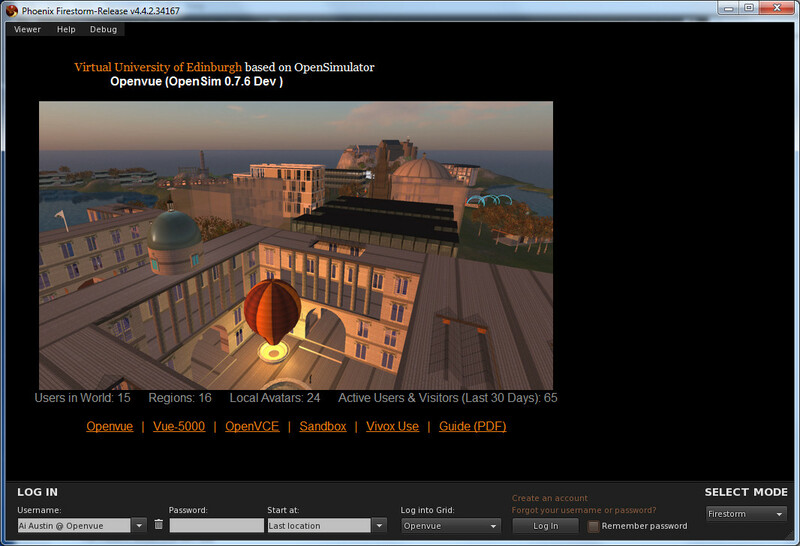 After some weeks of preparation and testing on an experimental server, a new core services server has been installed for the Open Virtual University of Edinburgh (Openvue) OpenSimulator grid run by Austin Tate in AIAI (Avatar: Ai Austin), in the School of Informatics as an experimental facility for the Virtual University of Edinburgh and it’s collaborators. Other Openvue facilities have been reconfigured to use this. Above is a snapshot of the live served map tiles (using Warp3D rendering). The current live served map is always available at http://vue.ed.ac.uk/openvue/. The white regions shown on the map are not yet running, but will be hosted on separate servers which allow for temporary and experimental additions to the core regions. 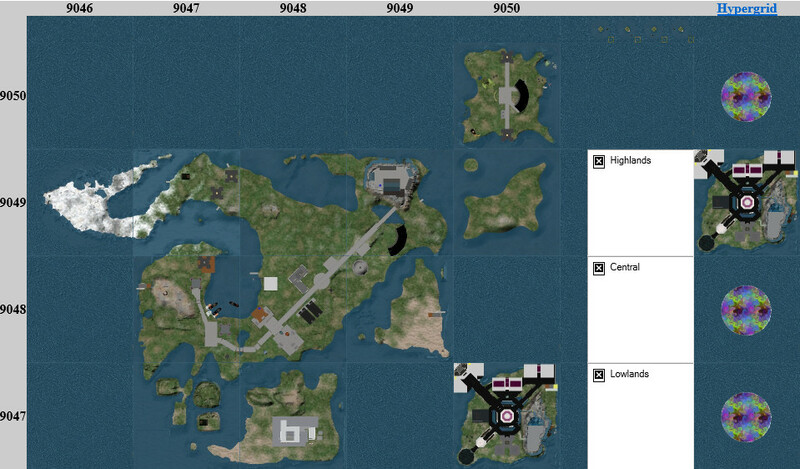 The column on the right shows some of the OSGrid Hypergrid reachable Vue regions. A “fresh start” OpenSim 0.7.6 setup with regions and core creator avatar UUIDs preserved. Assets imported via OpenSim Archives (OARs) and Inventory archives (IARs) (MANY thanks for that facility to OpenSim core developer Justin Clark-Casey). Openvue had been running since 2007 when OpenSimulator was at an early version 0.4. Its database had grown to 14.5GB, much of which was assumed to be inaccessible assets due to a lot of testing over the years, especially for mesh assets. The “fresh” version with region and avatar assets restored was 1.5GB. Tracking down a number of missing assets in regions or inventories and replacing them with good fresh asset copies. Positioning of the core Vue regions around 9050,9050 on the grid to be closer (within 4095,4095) to OSGrid regions to allow for single hop teleports between OSGrid and Openvue grid via the HyperGrid. Hypergrid jump to low region grids and high region grids still exist via Vue-5000 (at 5000,5000) and Vue-9000 (at 9051,9051). OSGrid-based jump regions also exist at Vue-3200 (at 3200,3200) and Vue-6400 (at 6400,6400). Conversion to use the new OpenSim “V2” core facilities for Groups and Offline Instant Messaging (thanks to OpenSimulator core developer Diva Canto). Working avatar profiles in place using the up-to-date “mysqli” version of OpenProfileModule as used on OSGrid. The server side PHP code and necessary additional MySQL data base table initialisation SQL commands file can be obtained via the OpenSimulator Profiles Module Wiki page. A precompiled DLL module can be obtained from http://download.osgrid.org/ and placed in your OpenSim bin directory. Note: this was subsequently replaced on 31-May-2013 by a core UserProfiles facility provided from OpenSim r/22811 by Bluewall. Thanks. The “Destinations” facility in recent OpenSim viewers such as Firestorm now works (thanks to OpenSimulator core developer BlueWall). On 20-Jun-2013: The Physics engine used by Openvue is changed to BulletSim. On 10-Jun-2013 the OpenSim.ini [XEngine] ScriptEnginesPath variable on all Openvue servers has been changed to preserve the script status outside the OpenSim installation directory over upgrades. This means that screen and other active objects stay in their active state when Openvue is upgraded. Thanks to Nebadon Izumi, a core OpenSim Developer, for this advice. The destination screen is served to the viewer from http://virtual.aiai.ed.ac.uk:8002/resources/guide.html. On this server, the MySQL 5.6.11 Community Edition data base is in place alongside the core OpenSimulator Robust.exe services and a couple of core regions on an OpenSim.exe instance. This server will provide experimental and temporary add-on regions for Openvue and OSGrid, using SQLite local asset data bases. A number of core Vue regions essentially similar to the original Second Life Vue setup are run on virtual3 which is a Dell 390 Workstation with a quad core xeon processor and 8GB of memory. Virtual2 is a Dell 390 Workstation with Intel Core 2 processor and 4GB of memory which provides some empty regions (sea regions which are navigable by vehicles and avatars and allow for distant scenery items) to improve connectivity in the new setup. Virtual4 is a Dell 390 Workstation with Intel Core 2 processor and 4GB of memory and provides the Vue add-on regions connected to OSGrid – currently Vue-3200, Vue-6400, Edinburgh (hosting the Fish4Knowledge and Hedlamp project pavilions and meeting spaces) and the OpenVCE region (a replica of the MOSES OpenVCE area). An Apple Macintosh OSX Pro Server with a quad core xeon processor and 8GB of memory acts as the main media server for Vue assets for Vue in Second Life and Openvue in OpenSimulator. It provides a QuickTime Streaming Service (QTSS) for media files and also a synchronised real rime steaming (.rsp) capability for live events announced and fed from a range of authorised computers and laptops and when synchronised viewing by students and meeting attendees is required. Vivox kindly provide occasional use voice services to Openvue through their support to the OpenSimulator open source community and small non-commercial grids. A FreeSwitch open source voice server is also available on one of our hosts as a backup. This entry was posted in OpenSim, OpenVCE, Virtual World and tagged OpenSim, Openvue, Virtual World. Bookmark the permalink.